Cognitive decline resulting from age-related neurocognitive disorders such as dementia can lead to the loss of individual rights. Providers must advocate on behalf of older adults with dementia to preserve their autonomy. Autonomy over oneself is a core value in Western society. We should be able to decide how we run our own lives without outside interference. Our laws allow each of us to live at great risk and make unsafe decisions so long as we maintain the capacity to understand those choices. The concept of autonomy as a basic right, however, is challenged in the case of neurocognitive disorders such as dementia. Early dementia symptoms can result in decreased ability to perform instrumental activities of daily living, such as cooking, banking, and driving. As dementia progresses, ability to perform basic activities of daily living, such as dressing, eating, and grooming, may also decline. This functional decline is followed by a gradual removal of independence—the loss of a driver's license, moving out of the family home, and surrendering power of attorney over financial matters. The person with dementia must now ask family members for rides, abide by the rules of a landlord or nursing home, and obtain permission to access his or her own money. Even before a formal declaration of incapacity, a large amount of autonomy has often already been surrendered. Incapacitated adults may be removed from perceived harm regardless of their expressed wishes. Health care providers can advocate for the autonomy of their patients with dementia by providing assistance in navigating through the complicated legal and ethical situations unique to each case. With respect to autonomy, dementia differs from other progressive and terminal illnesses in that the individual may eventually not understand the facts needed to make informed decisions concerning his or her well-being. A cognitively intact adult with an end-stage lung carcinoma may choose to remain at home, forgo treatment, continue to smoke cigarettes despite physician orders, and not call for help if needed. If this same adult has dementia and wishes to make these same choices, he or she may be declared as lacking capacity, prevented from smoking, and moved into a higher level of care. While this treatment may seem unequal, health providers are often left with few options, as they cannot consult with a person with dementia before he or she develops dementia to determine his or her wishes in case these types of situations arise. Encouraging patients who maintain capacity to create detailed advance directives with specific instructions can address this dilemma. Patients with mild levels of cognitive impairment can be encouraged to review and clarify these instructions regularly, with consideration of their unique health and living situations. Throughout advance care planning conversations, health providers should present information addressing ways in which additional factors, such as financial resources or health prognosis, could influence the reality and attainability of particular decisions. Although there remain legal and ethical issues to address for an adult with dementia living at risk, an advance directive allows him or her to be included in conversations about personal well-being, where he or she might otherwise have been absent. The advance directive provides some guidance to care providers and legal decision makers, which can be used to preserve a patient's autonomy and allow self-determination. Rather than health providers advocating for what they believe a person with dementia would want, the advance directive allows the person to advocate for him- or herself. Guidelines are lacking around dementia-specific audiology services and hearing aid testing. One study found that while nearly all audiologist respondents had treated patients with dementia, most did not feel supported in doing so.3 There is a progression of systematic invisibility in older adults with both cognitive and hearing impairment that may result in their being excluded from conversations about their own health. Health providers should consistently advocate for autonomy of those with dementia, regardless of their level of capacity. One way this can be done is by actively including these patients in conversations focusing on their place of residence and health care decisions. If the concepts being discussed are outside their level of comprehension, the language should be presented in a way that is less complex. Even with advanced dementia, encouraging involvement in simple decision making, such as what to wear and eat, can preserve some autonomy. Including a person with dementia in the decision-making process involves assessing the ability to adequately process sensory information. In community and hospital settings, families and staff can be encouraged to schedule residents for regular hearing and vision tests. In nursing homes, frontline staff should be trained on applying hearing aids and changing hearing aid batteries in order to adequately support those residents. Health care providers should utilize tools such as the Rowland Universal Dementia Assessment Scale for multicultural screening, which demonstrates high specificity and is less influenced by culture and language than the standard exam when screening for cognitive impairment among multicultural populations.6 Minimizing the influence of language and cultural barriers in the outcomes of cognitive and capacity assessments can help to preserve patients' autonomy. Care partners in nursing homes and family settings should be educated on methods to increase autonomy and independence in a person with dementia. Habilitation therapy is a strengths-based method that strives to increase an individual's independence and ability to communicate.7 Proactive techniques manipulate different experiential domains such as physical, social, communication, behavioral, and functional in order to simplify and thereby enhance decision-making capacity. In particular, the strategies within the communication domain involve reading body language and emotional responses rather than relying on deteriorating language capabilities. These strategies also suggest matching an individual's understanding of reality and then using distraction techniques to move on rather than correcting or reorienting the patient. Affirmative response method (ARM) is another strategy care partners can utilize with individuals with advanced dementia.8 ARM focuses largely on nonverbal communication and matching the reality of the person with dementia. In this method, care providers try to learn the history of the individual with dementia and the reasons behind current behaviors. Rather than forcing these individuals to adhere to a certain schedule and meet task demands, the care partner pursues an understanding of the purpose behind a behavior and then uses creative strategies to meet care needs within the current perception of reality. In these ways habilitation therapy and ARM preserve independence in individuals with advanced dementia when possible, and deter their sense of truth from being challenged or denied in the remainder of situations. The current challenges to maintaining autonomy in older adults with dementia result from often imperfect models of capacity assessments. Dementia itself is not a unilateral illness; there are different types that progress in different ways. Even the same type of dementia can present different symptoms, depending on how it spreads organically. Individual factors such as education, health, gender, diet, and exercise all influence the degree of demonstrated cognitive impairment.9 The way to preserve autonomy in an older adult with dementia, therefore, is not to enforce a strict model of capacity assessment and decision-making. Rather, drawing awareness to each of these factors as relevant will allow the patient to remain in the center of their care. For a person with dementia who wants to live in a way that may seem unsafe or unhealthy, extra attention should be given to understanding the aspects of his or her life and who that person was prior to the cognitive impairment. Creative solutions may be developed to minimize the harm without eliminating a person's rights. If an individual with mild dementia enjoys going for walks, he or she could continue to do so if he or she agrees to bring a cell phone, wear a GPS monitoring device, or go with a companion if it's unsafe to go alone. An individual with moderate dementia, who wants to continue smoking cigarettes but is unsafe in doing so, may be able to use electronic cigarettes instead. Health care providers should be resourceful and able to accommodate situations to maintain autonomy while not putting at risk an individual with dementia or others. A culturally competent and informed health care provider should acknowledge the ways lifestyle, culture, and language can influence decisions being made by and for an older adult with dementia. In any assessment or health conversation, providers should acknowledge and bring to the forefront potential barriers to communication and offer methods of resolution. In accepting the multifaceted nature of issues around autonomy in older adults with dementia, a health care provider will need to rely on introspection to continuously set aside biases and focus on each person in his or her own environment. Autonomy does not need to be dependent on a condition of capacity if we strive to preserve this basic individual right. — Brittany Faux, MSc, DCA, RSW, a healthy aging social worker at the Edmonton Southside Primary Care Network, has worked with medically complicated older adults since 2010. She serves as a designated capacity assessor in the province of Alberta, Canada. She is cochair of the Northern Alberta Gerontological Social Work Interest Group. In 2009, she completed an MSc in psychology from Memorial University of Newfoundland, with a research focus on age-related memory loss. 1. Dworkin RM. Life's Dominion: An Argument About Abortion, Euthanasia, and Individual Freedom. New York, NY: Vintage; 1993. 2. Cohen-Mansfield J, Taylor JW. Hearing aid use in nursing homes. Part 1: prevalence rates of hearing impairment and hearing aid use. J Am Med Dir Assoc. 2004;5(5):283-288. 3. Wright N, Stickley T, Mulla I, Bradshaw E, Buckley L, Archbold S. Hearing loss and dementia: an exploratory study of the views of audiologists. Qual Ageing Older Adults. 2014;15(4):220-231. 4. Bradford A, Kunik ME, Schulz P, Williams SP, Singh H. Missed and delayed diagnosis of dementia in primary care: prevalence and contributing factors. Alzheimer Dis Assoc Disord. 2009;23(4):306-314. 5. Sayegh P, Knight BG. Cross-cultural differences in dementia: the Sociocultural Health Belief Model. Int Psychogeriatr. 2013;25(4):517-530. 6. Nielsen TR, Andersen BB, Gottrup H, Lützhøft JH, Høgh P, Waldemar G. Validation of the Rowland Universal Dementia Assessment Scale for multicultural screening in Danish memory clinics. Dement Geriatr Cogn Disord. 2013;36(5-6):354-362. 7. Raia P. Habilitation therapy in dementia care. Age Action. 2011;26(4):1-5. 8. Wayman L. A Loving Approach to Dementia Care: Making Meaningful Connections with the Person Who Has Alzheimer's Disease or Other Dementia or Memory Loss. Baltimore, MD: The Johns Hopkins University Press; 2011. 9. Prince M, Albanese E, Guerchet M, Prina M; Alzheimer's Disease International. 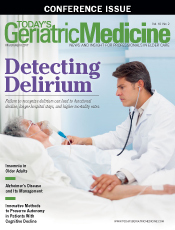 World Alzheimer Report 2014: dementia and risk reduction: an analysis of protective and modifiable risk factors. https://www.alz.co.uk/research/WorldAlzheimerReport2014.pdf. Published September 2014.